Comments: On the distant planet of Hypori, Separatist leader General Grievous and a legion of his super battle droids have surrounded a small group of desperate Jedi Knights. In response, the Republic dispatches an elite squad of fully equipped clone troopers with orders to destroy Grievous and rescue the Jedi! Captain Fordo: Leader of the task force known as The Muunilinst 10, Fordo is known for his aggressive fighting tactics and prefers to employ firepower over finesse. Fordo was once awarded the Chancellor's Service Medal, which he refused and transferred to a fallen member of his task force. Heavy Gunner Clone Trooper: Captain Fordo orders his heavy gunner to take out the super battle droids that are threatening the remaining Jedi. Knowing that the torso is the weakest part of the super battle droid's construction, this heavy gunner takes careful aim and wastes little ammunition. Clone Troopers: These clone troopers are all members of The Muunilinst 10. They will folow their leader, Captain Fordo, to the end, obeying his every command and destroying anything or anyone that gets in his way. Captain Fordo is a kit-bashed figure made up of the head from a Clone Trooper Captain, the body of a Clone Commander, and the pauldron of an ARC Trooper (red) and then repainted. It's only missing the rangefinder. Heavy Gunner Clone Trooper is a kit-bashed figure made up of the head of an AT-RT Driver, the body of a Clone Commander, and the kama of Commander Bacara. The cannon is from a GI JOE figure named Roadblock. 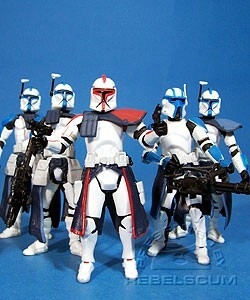 The Clone Troopers are repaints of ARC Troopers from the Clone Wars line. These figures are all based on the characters that appeared in the Clone Wars animated series on Cartoon Network. 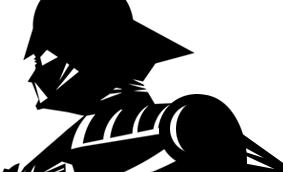 This battle pack was originally listed as Defense of the Senate in early lists and on the TRU computer system. Despite the UGH logo sticker on the box front, this vehicle has nothing to do with the promotion.